For toms, snares and percussion instruments, no other microphone stands up to the performance and versatility of the Beta 98D/S. 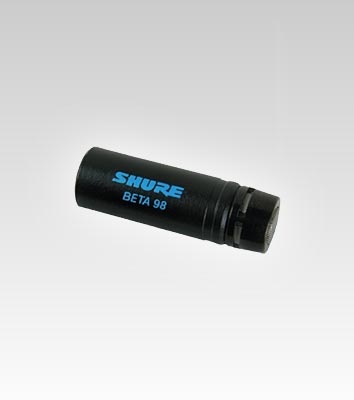 The Beta 98D/S is a high performance mini-condenser microphone designed to excel at professional sound reinforcement or recording. Its ultra-uniform pickup pattern provides high gain-before-feedback and excellent rejection of unwanted noise. The interchangeable cartridge (cardioid or supercardioid) allows you to adapt the microphone to specific applications. With the unique A98D microphone drum mount (supplied), no other rim-mounted microphone stays more securely in place. This hardware has been redesigned for quicker, more secure rim-mounting without the need for a drum key. Its flexible gooseneck lets you position the mic in practically any configuration, so you get a virtually unlimited choice of sound options.